Should Your Student Take a Year Off Before Graduate School? I remember when I started graduate school and on the first day of class, we were assigned to read over 300 pages and write a paper before the next class. My jaw dropped and I wondered if the professor was serious. Not every class is like this, but after four years in college, some students may choose to take a break before jumping into graduate school; whether it’s medical school, law school, an MBA or just about any other advanced degree. Graduate school can be a grind. There are other reasons students choose to take a break; or gap year, before going on to pursue an advanced degree. Many graduate programs prefer students to have some time out in the working world before grad school. It is not uncommon for students to partake in internships that will provide them with experience in their proposed field. Shadowing a professional in the field of choice for a year can be a great option. Others take additional classes that may be required for the graduate program of their choice but weren’t included in their undergraduate major. Some students planning to go to medical school may take science classes, for instance. Another great part of taking a gap year is it can be an opportunity to save money towards graduate school. Of course, many students prefer to travel and enjoy their time off as they know the marathon ahead of them will not leave much time for fun, but for most this is not a possibility. Some students say it is difficult to begin making money and then go back to being a “poor student’ again too. What is more important; a mental break or to jump right in while you have momentum? Do you feel you did well enough on the GRE, LSAT, GMAT, MCAT or any other graduate school entrance exam? Perhaps spending the next year studying to raise those scores should be on the agenda. A better score could mean a better graduate school. Along the same lines; perhaps this is your chance to show you are capable of more than your undergraduate GPA may reflect. Are you 100% sure you want to go to grad school? Going just because it seems like the next step can be a rather costly endeavor. I remember my dear friend went through three years of law school before he admitted he never really wanted to practice law. He happily works in the travel industry now. Perhaps a gap year working in a law office could have saved him a lot of time, money and stress. Will work experience make you a better applicant? It might. Some MBA programs, for instance, practically require work experience between undergrad and grad school. 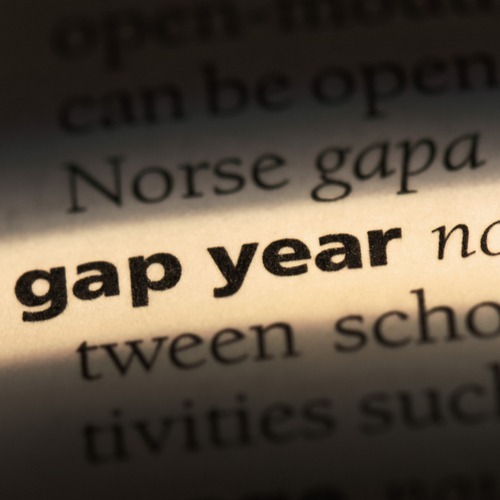 Whether a gap year means getting work experience, more time to think through grad school plans, enter grad school more mature (which many grad schools also view positively in the admissions process) or travel and chill, a gap year might be something to consider.